Throughout the past year American embassies, consulates, and ambassadors around the world have uploaded hundreds of videos to YouTube across a wide array of topics. Some are informative, like U.S. Ambassador to Japan John Roos updating American citizens following the devastating tsunami; some are inspirational, like First Lady Michelle Obama’s message to a school in Santiago; and others are instructional, like this video on what to expect at a visa interview at the US Consulate in Juarez, Mexico. In an effort to continue offering easy access to this information, we’ve launched the YouTube State Hub, a place to find all of the U.S. Department of State’s various YouTube channels in one place. This site follows the model of two similar YouTube channels, the House Hub and Senate Hub, which also help users easily find videos posted by government officials. 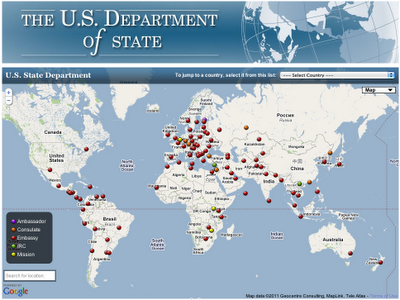 Just click on the pin in each country, and you can find content from that embassy. Throughout the coming year we’ll showcase some of the most creative videos from embassies, consulates and ambassadors around the globe on our CitizenTube blog and via our twitter account, @CitizenTube.